Completely customizable by you, the Artist Face Color collection lets you create a colour combination that’s unique to your preference and skin tone. Because, I don’t know about you, but I hate picking up any kind of palette pre-packed with colours that I’ll never, ever use. Ranging from subtle sheens to vibrant face powders, The Artist Face Color collection is not limiting or boring; it’s completely flattering. With a shade selection that is completely varied, the Artist Face Color collection separates itself into 3 main categories: blusher, highlighter and sculpting powders. How do the MAKE UP FOR EVER Artist Face Colors work? As I mentioned above, the huge benefit of the Artist Face Color collection is to create a personalised face palette that suits your complexion. 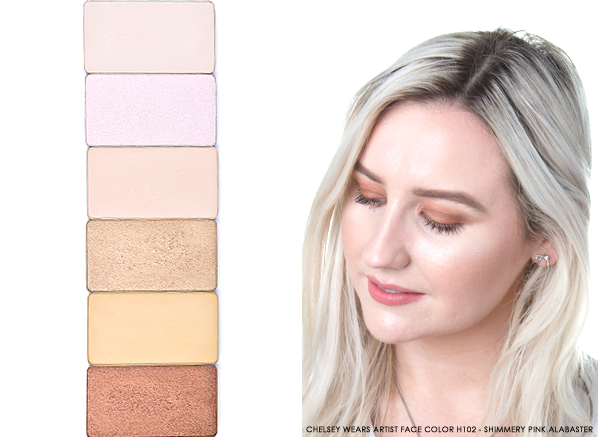 Therefore, to make the Artist Face Colors travel and touchup friendly, you’ll need to choose a specific Artist Face Color Palette to fit your favourite colour pan. What’s special about the Artist Face Color shades is that they offer you the option of matte and shimmery highlighting shades. 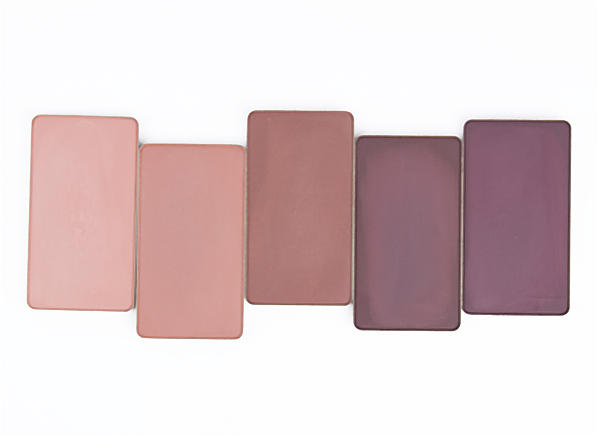 Perfect for each and every skin tone, this diverse array of radiance-enhancing hues are available in both cool and warm tones between the matte and shimmering shade selection. 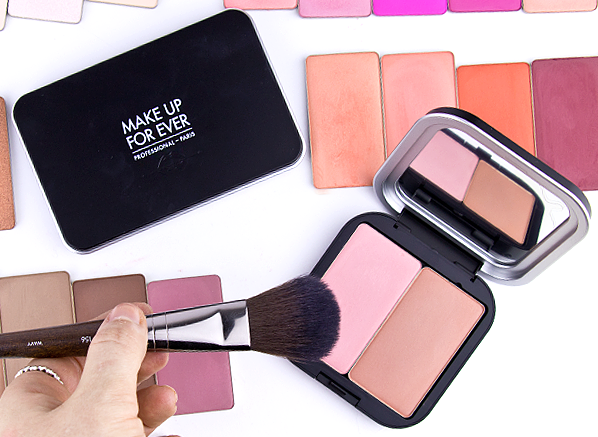 Top tip: Use the Matte Highlighter Shades to set concealer under your eyes for a visibly brighter finish. H100 – Ivory: This cool toned matte highlighter will add shape and dimension to a pale skin type. 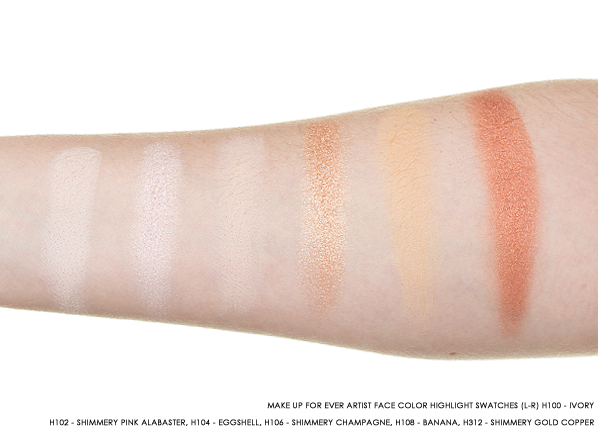 H102 – Shimmery Pink Alabaster: My daily go-to highlight, Shimmery Pink Alabaster is more of a sheen than a shimmer. 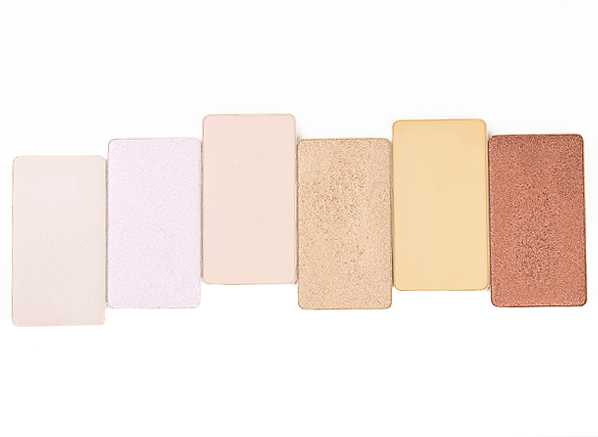 H104 – Eggshell: A matte, neutral highlight, Eggshell will set and perfect your highlight when you contour. H106 – Shimmery Champagne: This gilded gold hue will accentuate the high points of a light to medium skin tone. H108 – Banana: Ideal for medium to dark skin, this brightening banana shade shapes your look with a brightening yellow effect. H312 – Shimmery Gold Copper: Tailored towards the needs of a dark skin tone, this copper highlighter will reveal a warm, luminous glow once applied. The Sculpting Powders let you chisel your way to cheekbones and re-structure the shape of your features with their neutral undertone and soft, creamy texture. 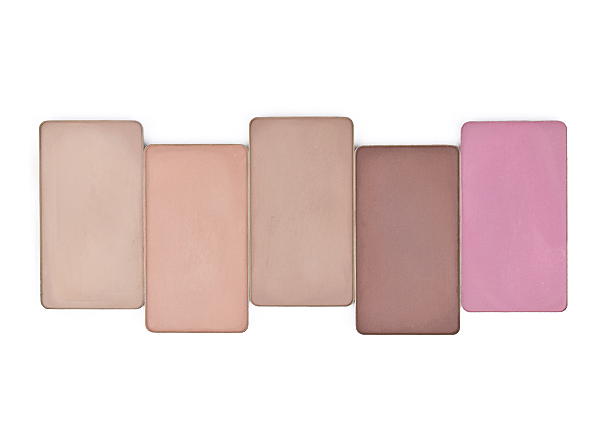 Air light and blendable, there’s a shade for everyone within this sculpting collection. Top tip: If you prefer a bronzer to a sculpting shade, opt for a warm undertone shade within the sculpting selection of swatches to emulate a healthy-looking tan. S112 – Shadow: For those that are afraid of orange tones, the Shadow shade will lightly carve in features that you never knew existed. 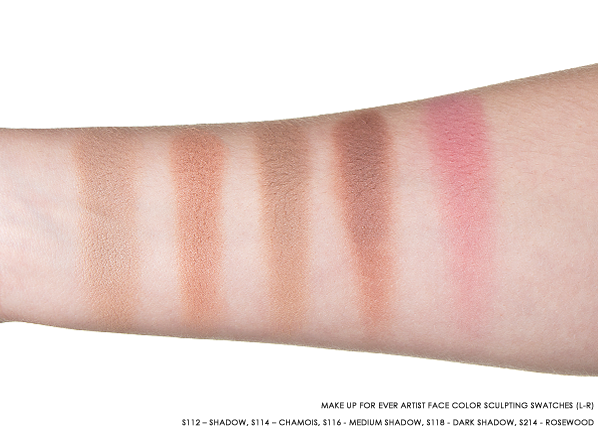 S114 – Chamois: This versatile shade is suitable for bronzing and sculpting a fair to light skin tone. 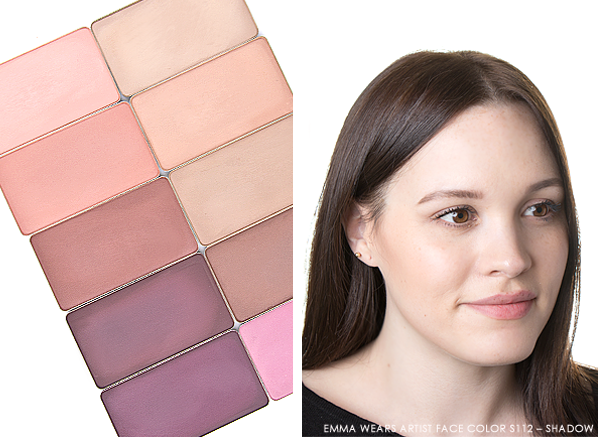 S116 – Medium Shadow: The grey undertone of the Medium Shadow shade is perfect for adding structure to a light to medium skin tone. S118 – Dark Shadow: Like a heavy contour? This shade’s for you! Just make sure you blend, blend, blend. S214 – Rosewood: Rosewood may look out of place in this lineup, but its mauve undertone works perfectly with the blush draping trend to lift and sculpt your look, creating a high-fashion finish. 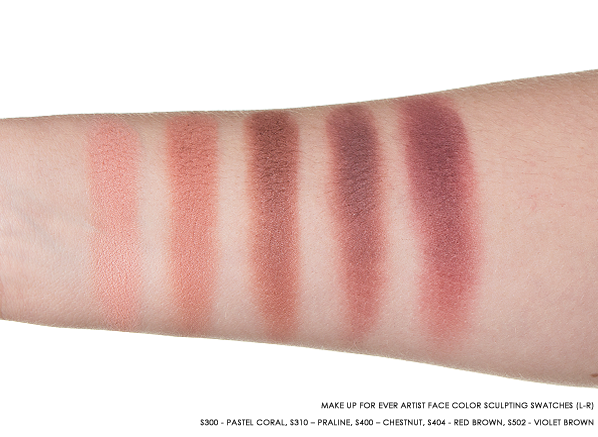 S310 – Praline: A deeper version of Pastel Coral, opt for Praline if you want to subtly sculpt a light-medium skin tone. S400 – Chestnut: Chestnut will beautifully structure a dark skin with its warm, yet soft contour shade. S404 – Red Brown: Perfect for a dark skin, Red Brown will add shape and warmth. S502 – Violet Brown: The darkest sculpting shade in the collection, dark skins with cool undertones will benefit from this shade. 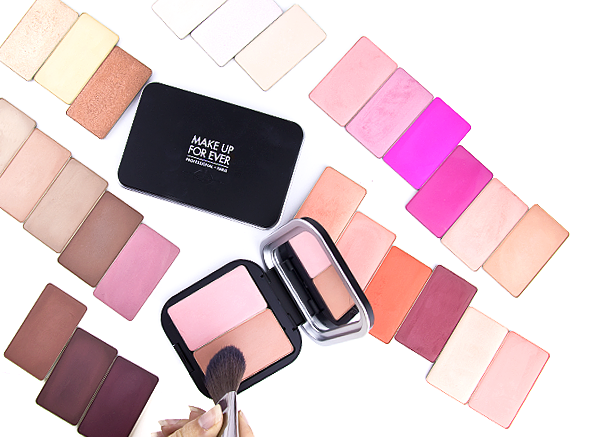 Whether your blush style is subtle or bold, the Artist Face Color collection will definitely have a shade that’s suitable for you. 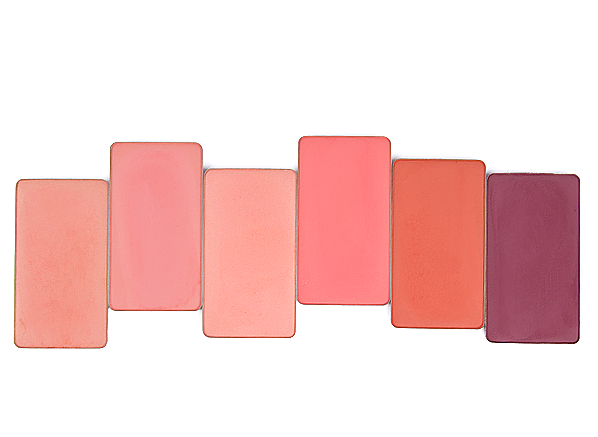 With a vast range of hues that appeal to pink, coral, red and violet lovers; you’re bound to discover a blush to make you flush within this huge collection of shades. 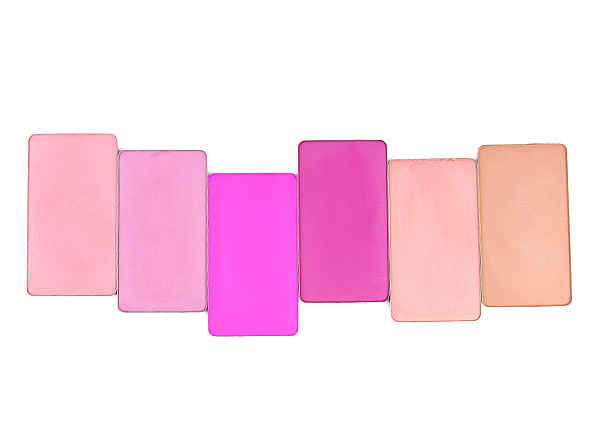 Top tip: When choosing a blush that looks natural, match the swatch to your fingertips for a barely-there blush finish. B110 – Peachy Beige: This delicate coral hue will gently uplift a pale skin with a neutral undertone. 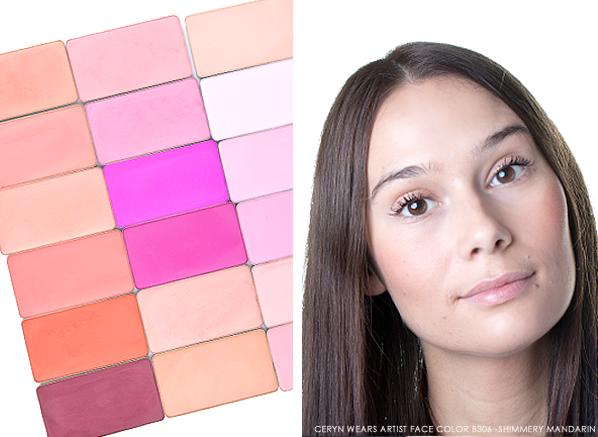 B200 – Shimmery Opal Pink: More suited to a fair skin with cool undertones, this fresh pink shade adds a gentle glow to your skin. B202 – Blue Pink: Again, perfect for cool undertones, this delicate pink hue adds pretty in pink flush to a light skin tone. 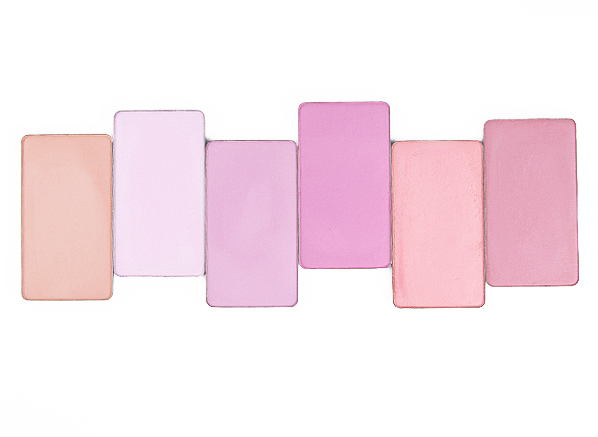 B204 – Cold Pink: Slightly warmer than blue pink, Cold Pink appears neutral on the skin. B206 – Peachy Pink: This coral/pink highlight will add subtle warmth to a light to medium skin. B208 – English Pink: The definition of an English rose, this warm pink hue creates a flush that looks healthy on a light-medium skin. 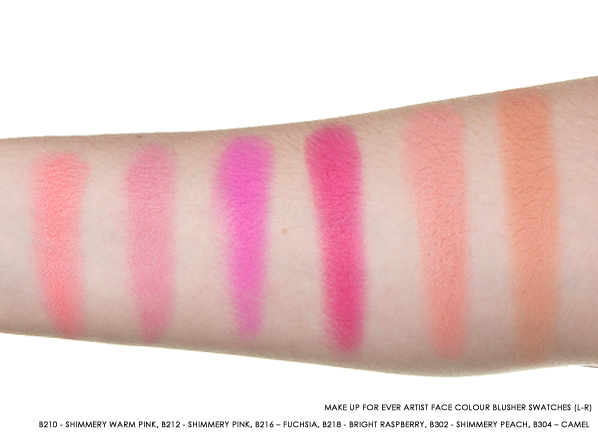 B210 – Shimmery Warm Pink: This peachy-pink blush is perfect to warm up a light-to-medium skin. 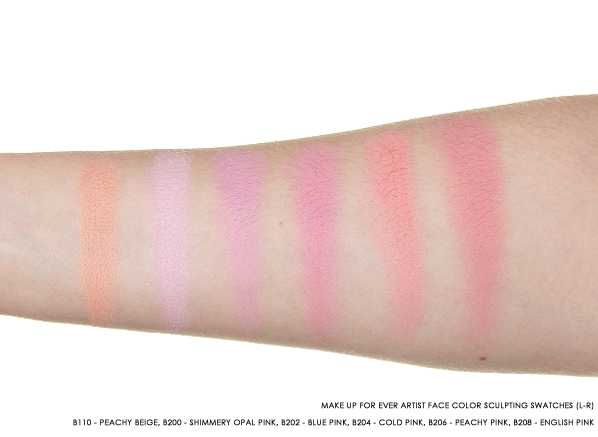 B212 – Shimmery Pink: Fitted with a neutral undertone, Shimmer Pink is better suited to a light-to-medium skin tone. B216 – Fuchsia: Beautifully bold, Fuchsia is the ideal match for someone that wants their blush to make a statement. B218 – Bright Raspberry: Gorgeous for a skin tone with warm undertones, the vibrancy of Bright Raspberry will complement a light or dark skin. B302 – Shimmery Peach: Warm and delicate, this shimmering coral shade will brighten up light to medium skin tones. B304 – Camel: Suitable for all skin tones, Camel is the ideal orange blush shade to create natural, warm radiance. B306 – Shimmery Mandarin: Once blended, this barely there but still beautiful shade warms and lifts the complexion. B308 – Coral: Uplifting for all skin tones, Coral has a delicate satin sheen that creates a lit-from-within glow. 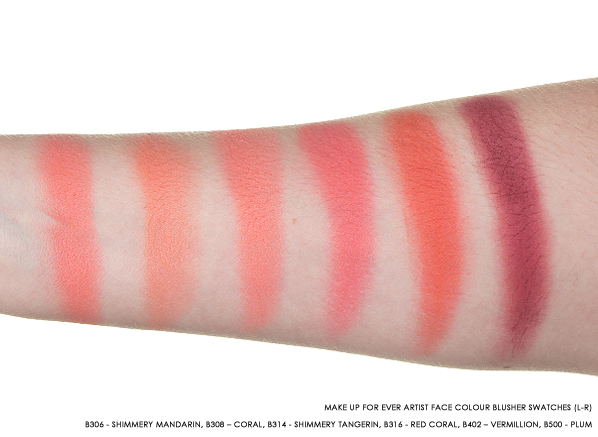 B314 – Shimmery Tangerin: The combination of Tangerin’s subtle shimmer and coral hue looks beautiful on all skin tones. B316 – Red Coral: More muted than vermillion, but still vibrant. Red Coral will warm up light to dark skin tones. B402 – Vermillion: This bright red rue instantly adds a burst of warmth to all skin tones. Fairer skins should apply less for a subtle wash of colour. B500 – Plum: Ideal for a darker skin with a cool undertone, Plum warms the skin with its burgundy shade. This entry was posted on Friday, September 29th, 2017 at 2:49 pm and is filed under Make-up, Swatches, Tried & Tested. You can follow any responses to this entry through the RSS 2.0 feed. You can skip to the end and leave a response. Pinging is currently not allowed.